Has the 944's time finally come? The model's popularity has led to a steady upward creep in prices in recent years, and this recent BAT result may just be the tip of the iceberg. Indeed, even Jerry Seinfeld is getting in on the action, having just acquired a black Turbo and this S2 Cabriolet. This 5k-mile 1986 Turbo just smashed Bring a Trailer's auction record for the model, doubling the previous top result for a 944 Turbo, and besting the previous top 944 sale by more than $30k. At $74k, this Pearl White coupe has reached beyond the model's typically-modest pricing, and well into territory normally occupied by low-mile Supra Turbos, Ferrari 328s, and well-optioned 993s. This result is the latest in a streak of increasingly impressive results for the model. Recent results from other auction houses, including an impressive $72,600 result at Gooding & Co's Monterey sale, have approached the result achieved on BAT. 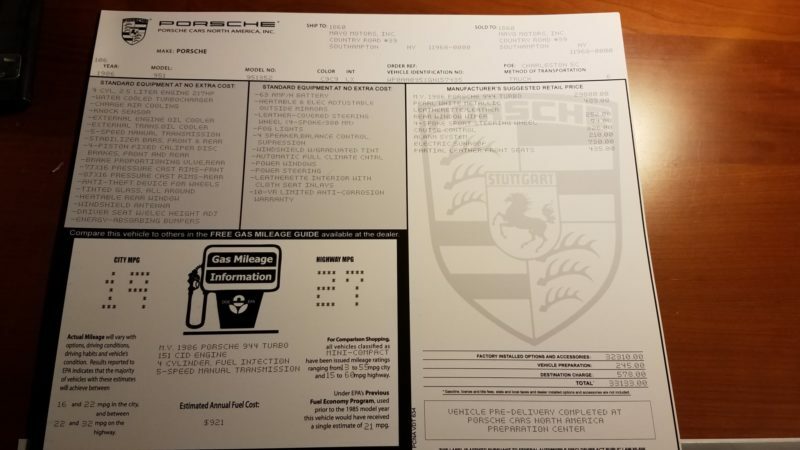 According to the included original window sticker the car originally sold for $33,600, meaning that over three decades the car more than doubled its original sticker price, and roughly kept pace with inflation. Credit is due to the seller's exceptionally thorough approach. While BAT sellers are generally very thorough, with galleries often creeping beyond 150 images, this seller went above and beyond with over 400 images. Everything from paint meter readings, to the stampings inside the included set of color-keyed Fuchs wheels were documented. It is pretty clear that this is an exceptional 944 Turbo. Interestingly, this car came from the same town as the Utlimate Enthusiast Garage featured here in 2017, though it was not owned by the same person. It's pretty clear, however, that this car lived an extremely pampered life. While aficionados may argue about the merits of this first-year Turbo compared to the later cars, we challenge anyone to find another comparable Turbo of any year. The real question with this car is whether to keep the phonedials on the car, or mount up those deliciously-'80s Pearl White Fuchs. Photos from Bring a Trailer LLC used with permission.